Ellypse desktop organizer features a four-compartment design to efficiently organize and arrange your frequently used office accessories. Its unique, curved construction provides easy access to a variety of items in different shapes and sizes. Shock-resistant polystyrene withstands minor mishaps and daily use for long-lasting organization. 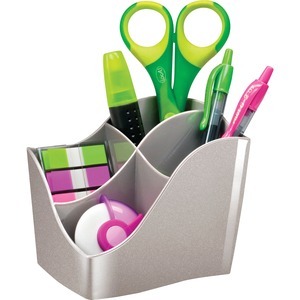 Desktop organizer is perfect for keeping pens, pencils, scissors, highlighters and more.